On the first Sunday of Advent, we lit the candle of hope. This candle invited us to look forward to a time when, as Isaiah declared, the nations would turn their swords into plowshares, and no longer learn the art of war (Isa. 2:1-5). As we know, that vision remains unfulfilled. Wars and rumors of wars have been with us in the millennia since these words were written down for our instruction. Nonetheless, the call of God to be peacemakers is ever with us. As we gather on the second Sunday of Advent we will light the candle of peace. The reading from Isaiah 11 is a fitting one, for it expands the vision of peace that was first revealed in Isaiah 2. It moves us beyond warring parties to the whole of creation. Indeed, the image that most clearly emerges from Isaiah 11 is that of lion and the lamb lying together in peace, though Isaiah doesn’t pair these two animals (lamb is with the wolf and lion with the calf). Most of us have watched enough nature programs to know that this isn’t normal behavior. Nonetheless, this is the vision proffered by Isaiah. We receive this vision of peace during the season of Advent as a messianic vision. While the vision has an original context—the eighth century BCE, a time when the nation of Judah was being pressed in upon by the superpower of the day, the Assyrian Empire—it took on a different visage among Christians. The original recipients of this vision were concerned that their small kingdom would fall prey to the Assyrians. After all, much larger nations had already succumbed, including, perhaps by this time, Judah’s northern neighbor, the kingdom of Israel. The reference to the “stump of Jesse” may reflect this reality. A stump suggests that damage had been done to Jesse’s tree. But perhaps there is hope, that out of the stump, that is the southern kingdom of Judah, one would emerge who could redeem David’s kingdom. This figure, according to Isaiah, would be anointed with the Spirit of God. the spirit of knowledge and the fear of the Lord. (Isa.11:2). If the kind of peace envisioned here could be achieved, then there would be need for such a leader as this. While it is likely that Isaiah had Hezekiah in mind, Christians have looked to passages like this from the Hebrew bible to frame the ministry of Jesus, whom the Gospels reveal to be the son of David. This is part of the reason for including the genealogies in Matthew and Luke. Jesus is understood to be the one who is filled with the Spirit, and therefore embodies this messianic vision. While David is understood to be king, as in Isaiah 2, in Isaiah 11, the messianic figure not only rules, but serves as judge over the people. Isaiah offers hope that the messianic king will judge in a way that brings about righteousness and justice. There are differences between this vision and the one Jesus embraces in Luke 4. In that case, Jesus draws from Isaiah 61:1, but the premise remains the same. In Luke 4 Jesus claims for himself a messianic status. He is the one anointed by the Spirit. In Isaiah 11, that anointing brings wisdom and understanding, counsel and might, knowledge and the fear of the Lord. With these gifts of the Spirit, the anointed king will bring righteousness and justice to the land. Indeed, this judge will rule in favor of the poor and the meek, which has echoes in the Beatitudes (Matthew 5:3, 5). This ruler will not base his judgment on what he sees with his eyes and hears with his ears. Instead, this judge will rule according to what is right and just. What Isaiah means here, I don’t think, is something akin to be “color-blind.” More likely Isaiah means that the rulings of this judge won’t be influenced by money and power. This judge can’t be bought. This judge isn’t impressed with worldly entanglements. The gifts needed to act in this way are endowments of the Spirit. Ultimately, we are led to the vision of the peaceable kingdom. Most assuredly this is an eschatological vision. It has a sense of a return to Eden in the imagery. Lions don’t eat straw as do the oxen. But while the vision is one of expectation, it is also an invitation to live into a peaceable kingdom, where harmony reigns not only among humans but in the realm of nature as well. We have this slogan in our denomination that declares that “All means all.” In this vision, all means all of creation, including lamb and wolf, calf and lion, child and asp. Indeed, we’re told that this peaceable kingdom will be led by a child. This inverts the power structures. Again, in the vision that child is likely to be Hezekiah, who gained the throne of Judah at the age of 12. The realist in me will complain that such a vision is pure fantasy, and it might be. Still, the vision of prey and predator at peace, offers us a counter-vision to much of human life. In a world where so many live in fear and worry, such a vision is hopeful. For Isaiah, the hope is that the new king, Hezekiah, can lead his people in such a way that Assyria (predator) and Judah (prey) can live together in peace. Assyria was like a lion or a wolf. It ate up smaller kingdoms. Judah itself was a vassal to Assyria, and got itself in trouble when it sought to extricate itself from its overlord. For Isaiah, Judah needed to attend to business, and live justly and righteously and not seek power. But what about us? How do we bring this vision to life? How do we move into a peaceable kingdom? Perhaps we can see this as an invitation to join with God in transformative ventures, working toward peace and justice and righteousness, and to start at home, in the church. The church has gotten itself in trouble, Christians have gotten ourselves in trouble, when we have sought power. That is, when we have tried to take on the role of predator. Jesus showed us a different way. 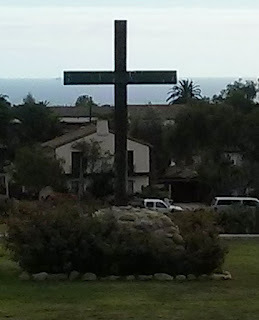 He became the prey, but in doing so turned the tables on the predator, making peace through the cross. As we continue the Advent journey, having lit the candle of peace, we can take with us this vision of the one who is filled with the Spirit, who will bring into existence the realm of God, which is a realm of peace, where predator and prey lie down in peace. Returning to Isaiah 2, they will learn war no more. Indeed, on God's holy mountain none will be harmed, because "the earth will be filled with the knowledge of God" (Is. 11:9). Picture attribution: Hicks, Edward, 1780-1849. 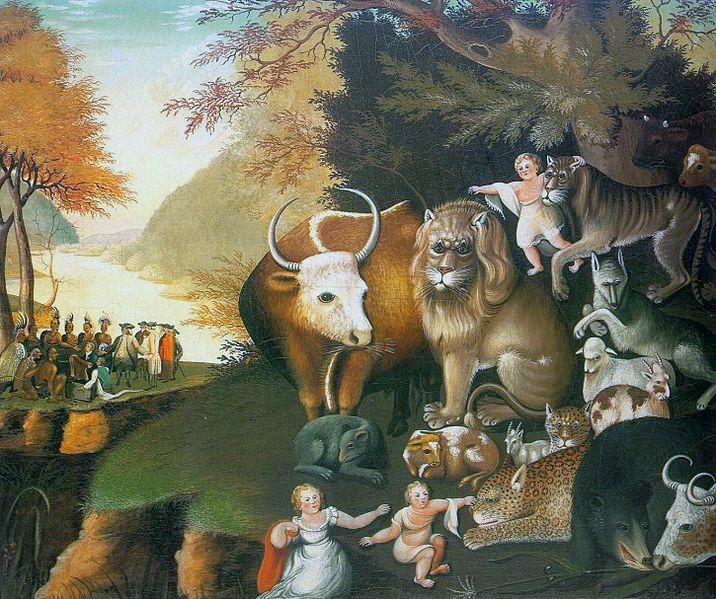 Peaceable Kingdom, from Art in the Christian Tradition, a project of the Vanderbilt Divinity Library, Nashville, TN. http://diglib.library.vanderbilt.edu/act-imagelink.pl?RC=53085 [retrieved November 28, 2016]. Original source: http://commons.wikimedia.org/wiki/Image:Edward_Hicks_-_Peaceable_Kingdom.jpg.